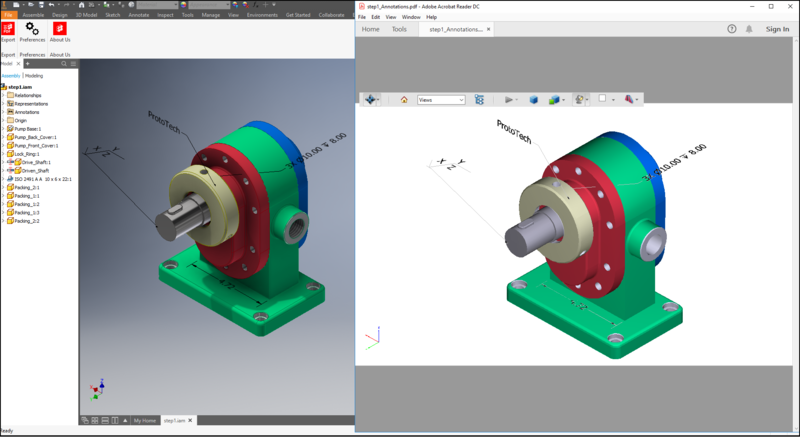 Autodesk Inventor is a computer-aided design application for 3D mechanical design, simulation, visualization, and documentation developed by Autodesk. Inventor allows 2D and 3D data integration in a single environment, creating a virtual representation of the final product that enables users to validate the form, fit and function of the product before it is ever built. 3D PDF is a standard Adobe PDF document that contains interactive 3D content. The user can view 3D CAD models from Inventor without any need for CAD software with the help of 3D PDF. 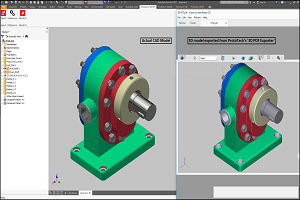 ‘ProtoTech’s 3D PDF Exporter’ for Autodesk Inventor allows the designers to export their 3D designs to highly portable 3D PDF (.pdf) format which can be shared easily with others. 3D PDF file can also be exported by Inventor’s native ‘Publish 3D PDF’ feature. 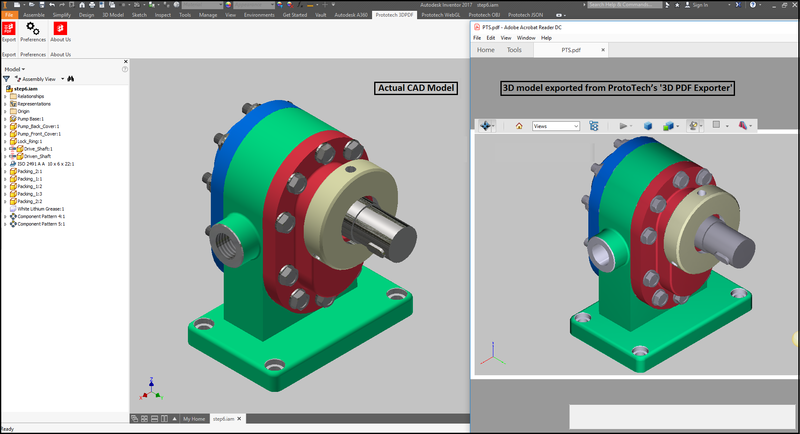 In this blog, I have compared the various aspects of these two ways to publish 3D PDF from Inventor including features, file size, and speed etc. The goal is to compare these two ways to publish 3D PDF in a transparent, independent, and neutral manner and see what observations could be drawn. ProtoTech Solutions has a highly successful plugin to export 3D PDF from Inventor called ‘3D PDF Exporter for Inventor’. This exporter plugin provides a wide range of features in their ‘3D PDF Exporter for Inventor’ with less time to export and smaller file size which makes it more convenient for use. Security feature to set a ‘Password’ to the exported PDF file. 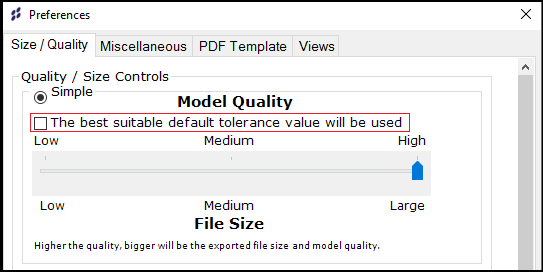 Option to control the ‘File Size’ and ‘Quality’ by specifying the ‘Precision’ value. There is always a ‘Default Compression’ which helps reduces the file size as much as possible. Support for Automation APIs using iLogic (VBA) script. Support for Automation API so the user can use 3D PDF exporter’s APIs from their own plugins. Implemented ‘Polygon reduction’ feature. 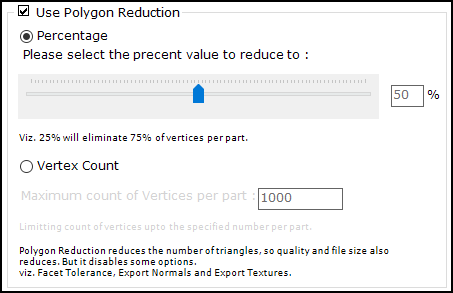 It allows users to reduce the number vertices, triangles and output file size. Added feature to export ‘Textures’. Specify precision for Vertices and Normals. 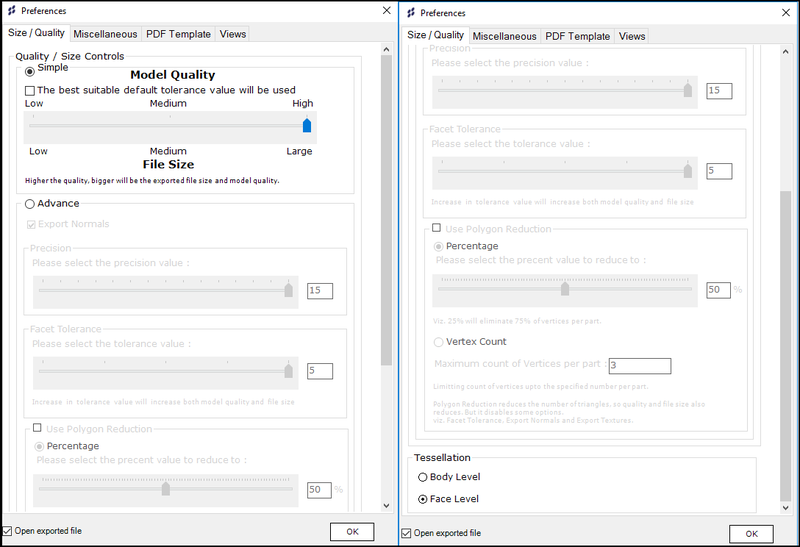 Feature to add a 3D model to existing ‘PDF Template’. Security feature- ‘Disable Measurement’ Tool. File size is a major factor while comparing exporter plugins. ProtoTech’s 3D PDF Exporter is a clear winner here. Most of the 3D PDF files exported by ProtoTech’s plugins are smaller in size than the files from ‘Publish 3D PDF’ in Inventor. The reduction in file size varies and it is in the range of 30% to 150% for typical files while there is no perceptible difference in the visual quality at all. Refer the following Image for visual appearance. Security is today’s biggest concern to the business models and for the software industry. ProtoTech’s 3DPDF Exporter provides a security feature, i.e encrypt the data and secure your 3D-PDF exported file. This feature allows the user to generate a password protected and encrypted 3D PDF file to attain your security goals. Native ‘Publish 3DPDF’ does not provide any security feature. Refer the following Image. Disable Measurement Tool is another security feature provided by ProtoTech’s 3D PDF Exporter. It allows the user to disable measurement of any entities in PDF graphics view within Acrobat PDF viewer. If the user wants to share the 3D-PDF file and to conceal model’s measurements, then it is a very useful feature. Refer the following Image.Native ‘Publish 3DPF of Inventor’ does not support this important functionality. This will allow the user to disable any user selections in an exported 3D PDF file. Native ‘Publish 3DPF of Inventor’ does not support this feature. This is an important feature for users who want to protect their IP and design and keep it secure from unwanted copy, the leak of information etc. Refer the following Image. The texture is one of the most important features associated with Visualization. It has been supported by ProtoTech’s 3D PDF Exporter. ProtoTech’s 3D PDF Exporter exports tessellated model data along with texture information as well. Refer the following Image. Native ‘Publish 3D PDF’ in Inventor doesn’t export texture information. A really useful functionality in ProtoTech’s 3DPDF Exporter for Inventor is the ability to export transparent parts in drawings and 3D Model into 3D PDF. User can export any transparent color or material with the same transparency as in Inventor with the help of ProtoTech’s 3D PDF Exporter plugin. Native ‘Publish 3D PDF’ in Inventor does not export transparency. Export Normal: Normals results in better lighting calculations and hence better photorealistic rendering. Precision: Specify Precision for the coordinate values. Facet Tolerance: To control tessellation quality exported in 3D PDF. Native ‘Publish 3DPF of Inventor’ does not export wire bodies. Simplicity is the main advantage of ProtoTech’s 3D PDF Exporter. It is very user-friendly and very efficiently designed GUI considering user’s workflow.‘Publish 3D PDF’ in Inventor has complex GUI. 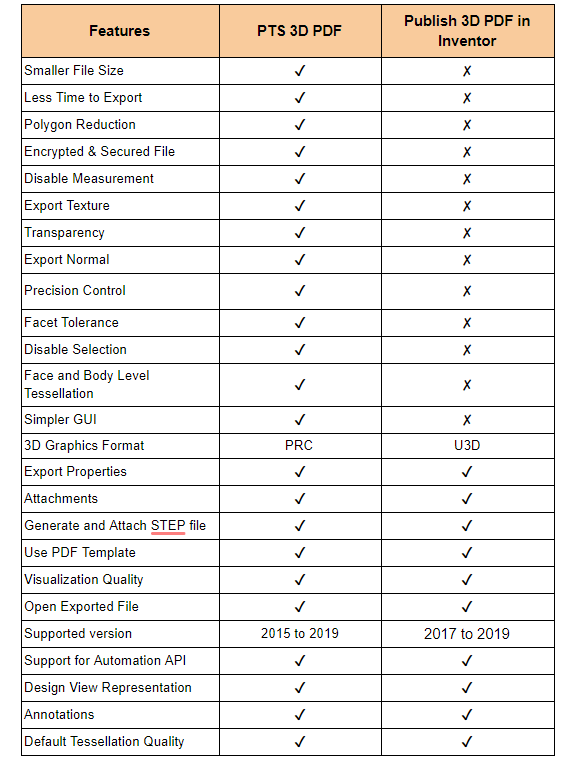 ProtoTech’s 3DPDF Exporter supports Inventor version 2015 to 2019. On special request earlier plugin supporting earlier versions of Inventor can also be provided. 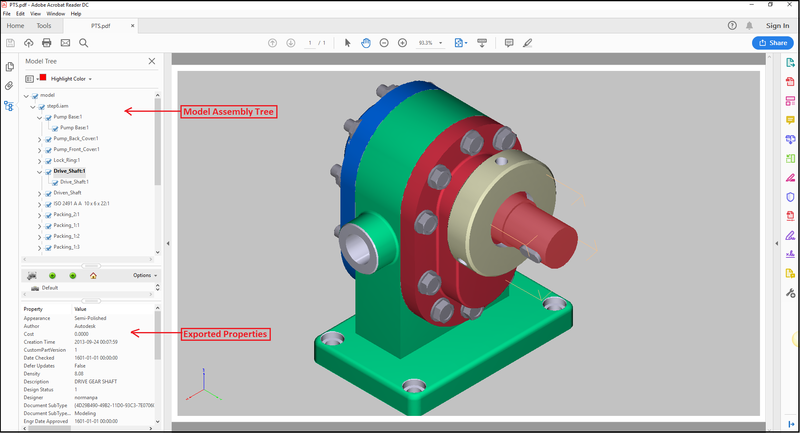 Native ‘Publish 3DPF of Inventor’ is available from Inventor 2017 onward only. PRC is the next generation of 3D graphics format used for embedding 3D data into a PDF file. Significantly more feature rich than U3D, PRC allows highly compressed geometric and visual representations to be added to 3D models and allows detailed structure, geometry, and product manufacturing information (PMI) to be included.PRC should be the format you investigate further as it is gaining ground within engineering, manufacturing, aerospace, geophysics, mining, and medical industries as the preferred encoding method for PDF documents. 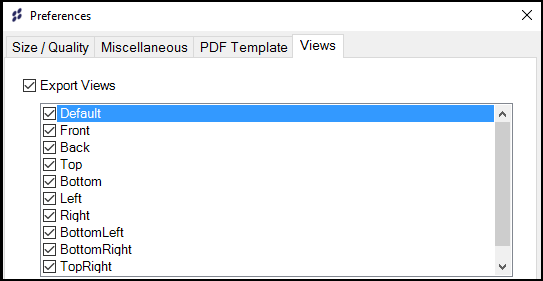 Option for saving 3D PDF with default tolerance setting. Here the same tessellated data would be exported in 3DPDF which Inventor internally creates for display in its own Graphics window. So the user will have a similar viewing experience in 3D PDF file and export time would be less. Refer the following Image. Model annotations are now exported into PDF using ProtoTech’s 3D PDF Exporter for Inventor. This feature works for Inventor 2018 and 2019. The user can now able to export different type of annotations such as- Dimensions, Surface Texture, Leader Text, Hole/ Thread Note Annotation etc. Refer to the following Image. Why use ‘ProtoTech’s 3D PDF Exporter’ instead of ‘Publish 3D PDF’ in Inventor? In essence, we can conclude that ProtoTech’s 3D PDF Exporter is better in all aspects i.e. in terms of Simplicity, Functionality, Security, Visualization etc. for many CAD users.